Youthful Days is a Christian Gospel magazine for young people. Bible based, its central theme is the need for a personal link with Jesus as Saviour and Lord. Bible quotations are from either the J N Darby version or the Authorised King James version of the bible. The reason I edit Youthful Days is because I want you to know about God's wonderful offer of salvation. It really is important to make sure you know God's forgiveness for your sins, and that you have peace with God. The work of Jesus on the cross has brought it all within your reach, and those who ignore God's offer do so at their peril. Youthful Days is also written for those who already know the Lord Jesus as their Saviour, and who depend upon Him day by day. Problems sometimes arise that are hard to solve, and He will show the way as we depend upon Him. And if Jesus is our Saviour, we need to tell others the good news too. 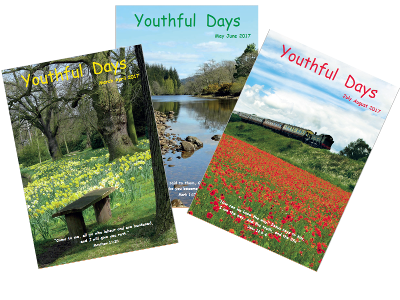 Each issue of Youthful Days comprises 20 colour pages with attractive front and back colour photographs, and contains short stories and articles that introduce the Gospel message, as well as strengthening young believers in their faith. Frequent Scripture quotations are included to encourage bible study. Typically there will be poems and stories of interest to the young, often linked to the front cover photograph, and a centre-page theme, as well as feature articles such as "Gospel Truth" drawn from the experiences of Christian outreach. Then there are short single-page introductions to fundamental Christian truths, some of which are also available via the editor’s email address as separate booklets of twelve fundamentals each. There are "People of the Bible" profiles which explain the lessons we can learn from the lives of people from long ago. Examples of these are available to view from the side menu, including a special feature article which will be regularly updated. Then there is a word search and a picture text page for children to colour and the back pages comprise the Bible Class which has sections for Gleaners (children under 8 years), Searchers (children from 8-11 years), and Students (those 12 years and above). An online version of the Bible Class is now available (use the Bible Class link on the left) which enables answers to be completed online, and they can be sent to the Editor by either email or post. Awards for Bible Class answers that are consistently accurate are distributed each year. There are six issues per year, and an annual subscription for Youthful Days including postage costs is £6. Copies are sent worldwide. To receive a free introductory copy of Youthful Days, please email your request to editor@youthfuldays.org.uk, or write to my address (see in Contacts), and I shall be pleased to send a copy to you. Examples of past copies can be viewed in the "Downloads" section. I hope you will enjoy reading Youthful Days and I shall look forward to hearing from you!